RIDOT is getting $1.2 million from the stimulus to study a third track at Kingston Station. The third track would provide a siding, allowing MBTA commuter rail trains to serve the station while highspeed Acela trains are able to move through without stopping. However, though we are getting stimulus love for Kingston Station, New England gets the shaft on the $8 billion federal high speed rail stimulus porgram. New England is getting under $200 million dollars or about 2% of the total funds. Massachusetts really lost out, no money for New Bedford/Fall River commuter rail, no money for the “inland route” which would have upgrade tracks between Boston and Springfield and improved service on the Worcester commuter rail line, and no money for the $1.9 billion north/south rail link in Downtown Boston (that last one is no surprise, no one wants to open the PR pandora’s box of spending more federal money in the Central Artery corridor post-Big Dig). 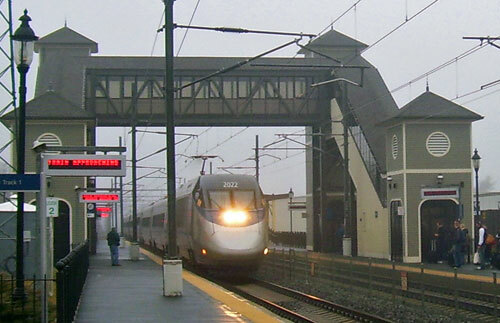 New England did get money to move forward on improvements in the New Haven – Hartford – Springfield – Vermont corridor, and to expand Amtrak’s Downeaster service north from Portland to Brunswick, Maine. I guess Kingston will supplant the potential Wickford station. Even still, it’s nice to see the reach of commuter real extending in RI. Wickford is set to open within 2 years. The PBN article said that work is already underway on the Wickford station. Is that true? How did I miss that news? Ah, the north/south connector. Wasn’t that the part of the bait that got switched out of the Big Dig deal? A few weeks ago I visited Salem to see the wonderful Peabody Essex Museum. I would have loved to go by train, but 2 subways or a taxi from South to North Station? Fuhgeddaboudit. I drove. Get off the comuter rail at Back Bay and take the orange line to North Station. But yeah, the gap is ridiculous. I think the silver line should run up the greenway to North Station to bridge the gap. Not ideal, but less than $1.9 billion. Sam: I haven’t been to Wickford Junction to confirm if shovels are actually in the ground, but if not, they are ready to go. All the t’s have been dotted and i’s been crossed. I was just down by the Wickford station this morning and no shovels are in the ground, it looks the same way as it has for the past couple of years. Just like the Warwick station not much happened at the site when they said it was underway, but that has changed a lot in the past year for Warwick. For these projects it’s more of a questions how long does it take to add the track siding and platform. Best to check with RIDOT re: Wickford Junction. I don’t think the design-build contract for the station/garage has been awarded yet, but the process is certainly underway. so how/where would the siding go? are they going to rip out that new platform & pedestrian overpass on the west side of the tracks? if you remember it was only a few years ago that this station had platforms on both sides of the tracks yet no pedestrian connection from the station to the west platform. i kid you not, you had to take a shuttle bus from the station on the east side for about a five minute journey to get to the west side platform, they even had to negotiate access through a lumber yard to get to the west platform. this was the only way to access the west platform, you miss the shuttle bus, you miss the train. The siding would likely be located to the west of the west platform. The west platform could access two tracks|the one in the middle and the new siding. There would be no need to modify the overpass or stairway/elevator. Also, the 138 bridge has an empty unused span or bay to the west where the track would go. I read that construction at Wickford Junction should start in May. At Kingston, there is room to the west of the existing 2 tracks for the 2-mile siding that would use the available portal under the route 138 bridge as Peter mentioned. Access to the new track would presumably be via the existing stair/elevator tower that spans the tracks now. APC’s NA HQ is located right near here as well as the growing URI campus. Modine MFG is also close to the station.